What’s Eddy Curry’s Problem TODAY? Until the game started, yesterday was a wonderful day at Citi Field. The Mets Hall of Fame, once a neglected theory, came to full, flowing fruition, and the reviews were grand; Doc and Straw looked happy and healthy, and Davey Johnson was funny and wry, like he always is these days. It felt, for the first time, like a true link between the Shea Mets and the Citi Field Mets, the scrappy, ugly-but-charming old days combining with the pretty quirky new digs. Citi Field is finally starting to feel like the Mets' home now. It was nice. Then the game started. 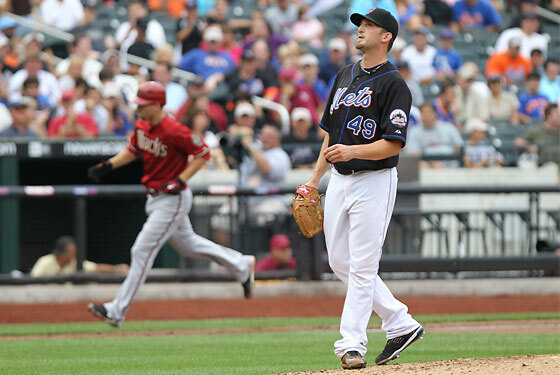 The Mets won't see the Arizona Diamondbacks again until 2011, and thank heavens for that: They were hammered 14-1 to fall to 1-5 against the last-place D-Backs on the season. It was a brutal series: The Mets needed a considerable amount of good fortune just to salvage one game, Jason Bay went on the DL with his concussion problems, and Oliver Perez pitched. (Badly, of course.) The Mets are now six and a half games behind the Braves, seven and a half out of the wild card, and facing playoff odds of 4.42 percent. There are two responses to this. One: CUT EVERYBODY. This one is satisfying and probably smarter than we'd all like to admit. The second is the Mets' not-uninspired decision: Do nothing. The Mets made no trades at the deadline. They're keeping Josh Thole and Jenrry Mejia and all other prospects. They're not giving up future pieces for an un-gallant plod toward an elusive postseason dream. They're just gonna run with what they have. That's surely not enough. But everybody knows that by now. It's not nearly as bad as last year, and hey, it won't be too much longer until it's over. Of course, maybe they'll win six on the road this week against the Braves and Phillies and we'll all feel differently. Sure!